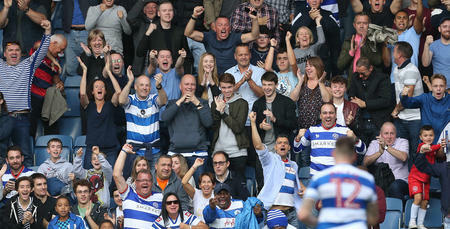 Ian Holloway’s QPR team gave it their all and even took an 18th-minute lead through Jamie Mackie. But it was visitors Villa who produced a dominant display thereafter to deservedly take home the points, as Albert Adomah struck either side of the interval – his first goal coming from the penalty spot – to signal victory for Steve Bruce’s men. Rangers boss Holloway made three changes to his R's side after defeat at Nottingham Forest before the international break. Jordan Cousins, Mackie and Matt Smith came into the starting XI, at the expense of Idrissa Sylla, Conor Washington and David Wheeler, who all dropped down to the bench. Reverting back to a 3-5-2 formation, the Hoops lined up as: Alex Smithies; Alex Baptiste, Joel Lynch, Jack Robinson; Cousins, Josh Scowen, Massimo Luongo (captain), Luke Freeman, Jake Bidwell; Mackie, Smith. Amid the wet west London weather, it was a relatively-even opening 15 minutes. Both sides fashioned attempts without troubling either goalkeeper. In the fifth minute, former R’s defender Chris Samba sent an improvised back-heel effort handsomely over, following Robert Snodgrass’ free-kick from deep, while Conor Hourihane also dragged a 20-yard shot wide for the visitors inside the first quarter-hour. For Rangers, striker Smith headed Mackie’s pinpoint cross off-target in the seventh minute, before Scowen’s daisy-cutter from the edge of the box was deflected wide soon after. A close encounter early on – but it was QPR who would seize the initiative on 18 minutes. Freeman’s right-wing corner caused havoc among the Villa ranks and, when Bidwell helped the ball on, Mackie pounced to smash home from all of a yard out. 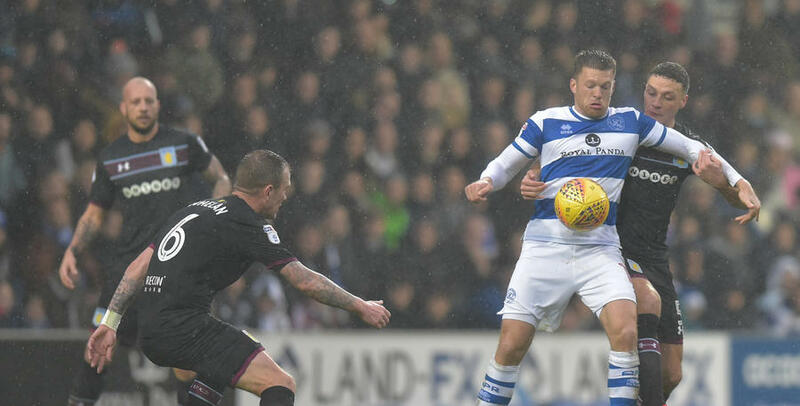 Lift-off at Loftus Road but, in truth, Aston Villa responded by laying siege to the home goal for the remainder of an entertaining first half. In the 21st minute, Adomah skewed wide from 20 yards. However, it was with his next opportunity just after the half-hour mark that the visiting man really should have scored from. A swift Villa attack resulted in Adomah being put clean through on goal, before the winger fired past the post after bursting into the box. Further let-offs followed for the R’s. On 32 minutes, Smithies tipped Josh Onomah’s goal-bound effort wide, while the Rangers goalkeeper also intervened to save from Keinan Davis with his legs in the 40th minute. Thereafter, Adomah’s snap-shot from 16 yards bounced up and against the crossbar as half-time approached, before Villa eventually levelled matters with a penalty in first-half stoppage time. Referee Darren England ruled that Robinson handled Snodgrass’ shot inside the box. And it was left to Adomah to finally get his name on the scoresheet – confidently converting from 12 yards. Holloway made a substitution at the break, replacing Luongo with Ryan Manning because of an assumed injury. 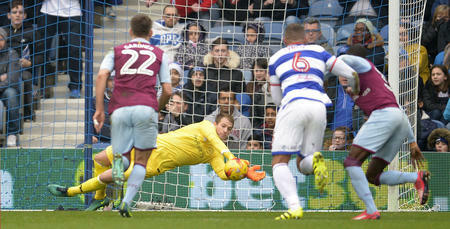 The R’s were first to threaten after the interval, as Smith saw his rasping drive held well by Sam Johnstone. Villa’s Davis then fashioned a header that dropped just wide. Both teams went even closer after that. In the 51st minute, Smith produced a half-volley from Freeman’s left-wing centre that flew only inches wide of the far post, while Villa’s Hourihane fired marginally over with a dipping 20-yard effort. Just like towards the end of the first period, the visitors were starting to look extremely-dangerous on the counter attack. And Bruce’s charges duly edged in front just short of the hour mark. A well-worked passing move ended with Hourihane feeding Adomah on the left-hand edge of the area, who subsequently shot home via the inside of the far post. Admittedly, that second Villa goal had been coming, and Holloway responded by bringing on Washington for Cousins in the 63rd minute. The R’s switched to a 4-3-3 formation in the process, though it was the visitors who could have been out of sight following Rangers’ defensive mishap moments later. Lynch surrendered possession just six yards from his own goal, but Snodgrass could only blast over from close range. 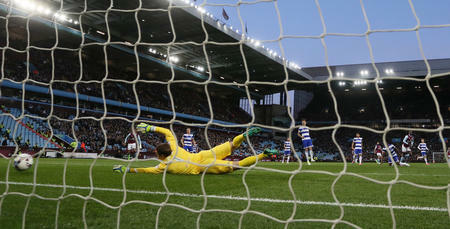 As Rangers searched for a second and subsequent equalising goal, Villa continued to look a real threat on the counter. The home side used their third and final sub in the 72nd minute, replacing Mackie with Sylla, before Freeman forced a smart stop from Johnstone following a dipping 20-yard volley. With the final 10 minutes approaching, could the R’s earn themselves a plucky point? Eight minutes from time, Manning crossed for Smith to head straight at Johnstone. However, unfortunately, that was as good as it got for Rangers, who huffed and puffed but couldn’t find a second – despite some five minutes of added time in the second period.